Valentine’s Day is one of the many days of the year where you can get into some serious trouble with your other half if you don’t put some effort in to spend a relaxing and romantic evening together! There is just one thing that you have to do, but don’t worry, it’s definitely the easiest part! Simply book a table and let us know what time you are going to be visiting us. You can even reserve your table directly online by visiting toku-restaurant.co.uk. Did you know, we even have a special mobile version of our Toku website for all you tech-savvy smartphone owners, so there is no excuse now! Check the Toku Valentine’s Day Special Menu and book online or by phone now! What If I Want To Stay At Home? If you prefer to have a romantic night in for Valentine’s Day this year then no problem, Japan Centre can still help you out! We guarantee that your partner will love these heart shaped sushi rolls, exquisitely handmade by you and seriously awesome! 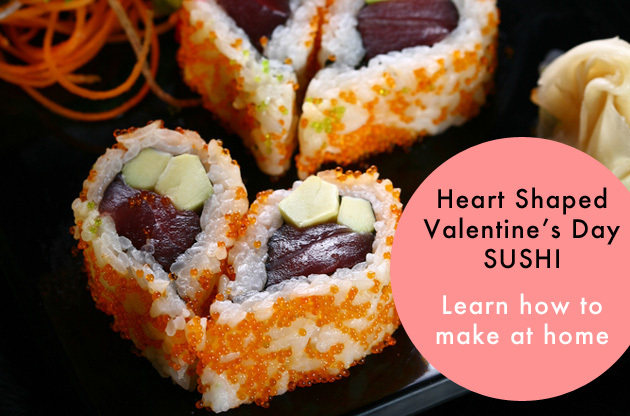 They are easy to make at home too, just follow our Heart Shaped Sushi Recipe online and you will be throwing Japanese kitchen knives around like an expert in no time! Whatever you plan for Valentine’s day this year, we hope you have a great evening and that you can share the love for many more happy years to come!